Clearly has a Customer Appreciation Sale on now! 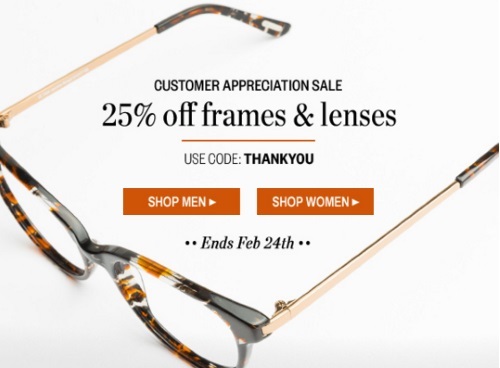 Get 25% off frames and lenses! Excludes Oakley, Arnette, and frames priced at $19, $29 & $39. Excludes coatings and mirrored prescription sunglasses lenses. Promotion cannot be combined with any other discount or code and is subject to change without notice. We reserve the right to cancel orders deemed fraudulent. Eyeglasses frames include 1.59 index single vision clear lenses (recommended for prescription range of +3 to -3). Coatings and/or lens upgrades are extra. Click here to browse Clearly.